LEO GOLDBERG WAS ONE of the most distinguished leaders of the astronomical community in this century. He achieved outstanding success in the application of atomic physics to astrophysical problems, and is best known for pioneering efforts in the study of the sun from space. He was director of three important observatories: University of Michigan (1946–60), Harvard (1960–71), and Kitt Peak National Observatory (1971–77). He played an important role in founding the Association of Universities for Research in Astronomy, Kitt Peak National Observatory, and the National Radio Astronomy Observatory. He contributed real leadership as president of the American Astronomical Society (1964–66) and the International Astronomical Union (1971–76). Goldberg came from a family of very limited resources, emerging as a Horatio Alger-type hero in the academic world. His experience is an irrefutable answer to those who would deny a young person a chance in life because he happens to be poor. Goldberg's parents emigrated from East Poland, then part of the Russian Empire, before World War I. His father worked in the needle trades: men's caps and for a time in ladies' millinery. In 1922, when Leo was nine, a disastrous fire destroyed their Brooklyn tenement home and killed his mother and younger brother. Leo and his older brother were hospitalized for months. In 1924 his father remarried and in 1925 the family moved to New Bedford, Massachusetts. His father had little formal education but great appreciation of its importance. The family was poor. After school and on weekends Leo worked in the family store. Young Goldberg did well in school; he especially liked science and mathematics. He won a scholarship to Harvard where he enrolled in the engineering program in 1930. The scholarship covered only tuition, not living expenses. A member of the scholarship committee, recognizing Leo's remarkable abilities, offered a loan of money, which, combined with his earnings during the summer and at various odd jobs, permitted him to attend Harvard. Goldberg started out in engineering, but he was not very excited by it. By a lucky accident, he enrolled in Astronomy 1 with Bart J. Bok, who introduced him to Donald H. Menzel, a theoretical astrophysicist who had come to Harvard in 1932 from Lick Observatory. Leo quickly switched to astronomy, which was not difficult because he had the necessary courses in mathematics and physics. He worked on a problem of relative multiple strengths in atomic spectra, a serious topic in the interpretation of stellar spectra. His interest in the field of atomic spectra continued throughout his career. Harvard summer school attracted distinguished astronomers, and Pol Swings and Anton Pannekoek from Europe and Paul W. Merrill, Henry Norris Russell, and Otto Struve from the United States proved a great inspiration to young Goldberg. Leo won a prize for a paper on He I lines based on his 1938 thesis. He was able to attend a meeting of the International Astronomical Union in Stockholm. In 1940 he visited the Mount Wilson and Lick Observatories, where he saw a variety of high quality spectroscopic equipment (then utterly lacking at Harvard). This experience proved very enlightening. Shortly before Pearl Harbor, Leo was appointed to the staff of the McMath-Hulbert Observatory, directed by Robert McMath, a Detroit businessman who had built it with the help of his father and an acclaimed jurist, Judge Ferdinand Hulbert. The observatory was well known for its pioneering photography of transient solar phenomena, primarily prominence and chromospheric changes. During the war, Goldberg worked successfully on an antisubmarine project at McMath-Hulbert Observatory. In one way Michigan's astronomy department was like Harvard's, where I had done my graduate work. It was full of strong-minded and rather self-centered people with widely different scientific interests. But in another way it was strikingly different. Everyone seemed to like everyone else, and everyone seemed happy and productive in his or her work. This was something my Harvard experience had not prepared me for. It became clear that this harmonious, stimulating, and mutually supportive atmosphere had been created and was being maintained by one person, Leo Goldberg. Thus, Goldberg was the right man in the right place at the right time. Besides the McMath-Hulbert Observatory at Lake Angelus, near Pontiac, Michigan's observatories included the original one in Ann Arbor with its small refractor of 1850 vintage and a homemade 37-inch reflector built in the early twentieth century and devoted exclusively to stellar spectroscopic work. There was also the Lamont-Hussey Observatory at Bloomfontein, South Africa. This observatory was devoted entirely to the measurement of optical double stars; it played no role in the teaching or research of the postwar students and staff. Before World War II, interest had been focused on a large modern reflector, and then director Heber D. Curtis had acquired a 97-inch disk intended for the primary telescopic mirror. First the Great Depression and then the war scuttled the project. Goldberg decided that Michigan with its poor meteorological conditions and ''bad seeing" was no place for a large reflector. He opted instead for a Schmidt camera similar to the one at the Case Institute of Technology in Cleveland. After a discouraging start with initially bad optics, a splendid telescope was finally produced. This instrument was used successfully for direct photography, objective prism surveys, and photoelectric photometry. When Cerro Tololo was established, the Michigan Schmidt was sent there to do excellent work on the southern skies, especially objective prism spectroscopy with "good seeing." The foresight of Goldberg and his associates paid off handsomely. Under Goldberg's leadership, teaching and research advanced impressively. Many capable graduate students were engaged in research projects in solar and stellar spectroscopy, galactic structure, photoelectric photometry, and theoretical astrophysics. At Lake Angelus, McMath and associates had been quick to exploit the advantages of the Cashman lead-sulfide cell for near-infrared high-dispersion solar spectroscopy. Later Goldberg and his staff constructed a high-dispersion, high-resolution spectrograph. The interior was evacuated to prevent air currents, which have blurred spectral lines, from producing bad seeing, thereby ruining the critical definition required in the best solar spectroscopy. The rise of radio astronomy as a productive area of research led Goldberg to pursue possibilities in this field. Starting with a 20-foot dish and devices to monitor solar activity associated with solar flares, he was able to entice Fred Haddock of the Naval Research Laboratory in Washington, D.C., to take charge of the erection of an 85-foot dish, used in recent years for investigation of variable radio galaxies. During the 1950s Goldberg became increasingly involved in problems of national astronomical interest. As noted below he played an important role in the foundation of the national optical observatories and later in the establishment of a national radio observatory. Many astronomers and groups had expressed concern about the role of radio astronomy in the United States and conferences were called in 1954 and 1956 to address this issue. In 1956 the National Science Foundation decided to have Associated University, Inc., undertake the establishment of the National Radio Astronomy Observatory. Goldberg was offered the directorship, but he declined. Goldberg also played an active role in the American Astronomical Society, as well as the International Astronomical Union, of which he later became president. Goldberg was one of the first to appreciate the importance of observations of celestial objects, particularly the sun, from above the earth's atmosphere. The first observations of the ultraviolet solar spectrum were the rocket measurements of Tousey in 1946, but it was the possibility of data secured from satellites following Sputnik in 1958 that really fired his enthusiasm. Then at Michigan, he proposed a large project for satellite instrumentation. This enterprise involved ambitious developments that would require not only experts who would be paid by government contracts, but also a considerable investment in buildings, which would have to be underwritten to some extent locally. The administration at Michigan failed to grasp the significance of the scientific breakthrough offered by space astronomy. At the same time, Harvard's department made an offer so attractive to Goldberg as to be irresistible. The ineptness of the administration at the University of Michigan just made the decision that much easier. When Goldberg came to Harvard he undertook an ambitious three-pronged enterprise: the building of orbiting observatories, establishment of an astrophysical laboratory, and the erection of a new building to house these activities and provide new quarters for the astronomy department. The orbiting solar observatories carried telescopes that could get monochromatic images of the solar corona at various wavelengths that were inaccessible to ground-based telescopes and radio these data back to earth. The astrophysics laboratory was equipped with devices such as shock tubes, which would produce plasmas (of short duration) but whose temperatures would mimic those of the corona, chromosphere, and the corona-chromosphere interface. A striking demonstration of Goldberg's administrative skills was his ability to accomplish all of this and at the same time carry on the inspired research programs described below. The task was far from easy. Under previous director Harlow Shapley the observatory's reputation for instrumentation was undistinguished. Far more serious, however, was the intrinsic difficulty of these horrendously complicated experiments. Goldberg's team worked diligently from 1960 to 1967 before they launched a successful satellite, the OSO IV. The next, OSO V, gave faster scans of the sun and was even more successful. When Goldberg came to Harvard in 1960 he found himself in a complex administrative situation. Menzel was still director of the Harvard College Observatory (HCO); the newcomer was paid 50-50 by Harvard and the Smithsonian Astrophysical Observatory (SAO). SAO had come to Harvard in 1955. There were in effect two separate observatories with no joint planning. Fred Whipple, director of SAO and a professor at Harvard, sat on the observatory council and participated in affairs of the HCO. But the converse was not true; the department was not consulted on SAO appointments. On the other hand, the SAO contributed a great deal to the HCO, astronomy department, library, and shop and provided part-time jobs for graduate students. Still, this was a radically new experience for Goldberg. In 1966 he became director of the HCO and chairman of the Harvard astronomy department. His philosophy on how the observatories ought to be run differed from Whipple's and contributed to his decision to leave Harvard and accept the directorship of Kitt Peak National Observatory. Leo had true concern for the Harvard students. He worked diligently to ensure that financial support, fellowships, scholarships, and assistantships would be available to enable us to continue in school. For students, this interest and care often provided the encouragement necessary to pull through the degree requirements. Although Goldberg had zero tolerance for second-class work or thinking, he always felt that criticism should be constructive, a point of view that is often woefully lacking in many research proposal evaluations or refereeing of papers at the present time. In the winter of 1966 officials at the National Aeronautics and Space Administration approached Goldberg to accept the directorship of the Goddard Space Flight Center. This was an immense enterprise with a budget of $500–$600 million a year, mostly spent on tracking stations and engineering. At nearly the same time, Menzel decided to step down as director of the HCO, and the position was offered to Goldberg. Thus, there was no lack of job opportunities, as at the same time he could have taken charge of the Yale astronomy effort. Goldberg decided to assume the directorship of the HCO. He was now working full-time for Harvard, having dropped the SAO half position. He also assumed the chairmanship of the department, previously held by William Liller, and was now able to integrate better the teaching and research capabilities at Harvard, expand and improve the curriculum, and direct the students to more exciting and relevant research problems. He strengthened the research and teaching staff at the HCO with appointments of distinguished scientists such as the spectroscopist Alex Dalgarno. In addition to his academic duties and government advisory activities, Goldberg undertook an intensive effort to obtain substantial financial support from Harvard alumni and well-wishers. Particularly noteworthy was the gift of some millions of dollars from the Perkin family (of Perkin-Elmer Optical Company fame), which, combined with smaller grants from other friends of Harvard and a grant from the National Science Foundation, financed the construction of the Perkin Building for the HCO. This building provided office, library, and laboratory space for the rapidly developing programs in experimental and theoretical astrophysics. By 1970 all of these endeavors had either paid off or were well on their way to fruition. The analysis of the solar data laboriously obtained with the OSO satellites had become increasingly the responsibility of Goldberg's younger, gifted collaborators Andrea Dupree and George Withbroe. The astrophysical laboratory with its shock tube and high-temperature experiments under E. M. Reeves and William H. Parkinson was producing valuable data. But relations between the HCO and SAO were not quite as harmonious as Goldberg had wished. His days of untrammeled, novel, and trail-blazing research were over. He was tempted by a new challenge not long in coming. In the summer of 1952 a small group convened in Washington to consider the needs of astronomy for the newly founded National Science Foundation. Except for the fortunate staff of places like Mount Wilson-Palomar or McDonald Observatories, the outlook was often bleak. Most astronomers were associated with colleges in the east or mid-west, where the climate was deplorable, particularly for stellar photometry. John Irwin of Indiana University urged the establishment of an observatory in the southwest, where the skies are clear and the visibility often good. A group of interested astronomers met in Flagstaff, Arizona, in 1953 to discuss the establishment of an observatory devoted to photoelectric photometry and open to qualified observers from all over the country. Goldberg was among those who attended this conference. He rephrased the proposition somewhat as follows: "This endeavor is so important that we must not restrict such an observatory solely to photometry. It should embrace all the needs of ground-based astronomy, including spectroscopy." Thus was the fundamental concept formulated for what was to become the Association of Universities for Research in Astronomy (AURA). AURA developed the Kitt Peak National Observatory (KPNO) in Arizona and the Cerro Tololo Interamerican Observatory (CTIO) in the foothills of the Andes near La Serene, Chile. Goldberg formulated the practical plan of how the observatory was to be operated. The governing board was to consist of representatives (a scientist and an administrator) from each of the interested universities. The original AURA board included Caltech and the Universities of Arizona, California, Wisconsin, Indiana, and Chicago and Harvard University; other academic institutions were added later. AURA was incorporated in Arizona. Goldberg was not a member of the first board. McMath insisted on representing Michigan, and Leo did not become a member officially until he became the Harvard director, although he exerted much influence. Upon the retirement of KPNO director Nicholas U. Mayall in 1971, Goldberg was appointed to replace him. The organization of the observatory was thoroughly overhauled in a period of decreasing budgets. Fortunately, Goldberg was able to do this so that the operation of the observatory was not impaired for the first three or four years. Thereafter, the budget cuts seriously affected activities. The observatory had to maintain the general-purpose equipment in tiptop condition for the users and at the same time develop new instrumentation as research progress demanded it. Problems of organization and administration were tremendous. Guest astronomers, many from small colleges and not too familiar with astronomical instrumentation, had to be taken care of and kept happy, requiring a large, capable, and diplomatic support staff. In addition, CTIO had special problems arising from the operation of a modern observatory at a remote site in a distant country. Victor Blanco, the CTIO director, handled this very capably. In addition, KPNO had the responsibility for developing new instruments and putting them into operation. These included the 4-meter Mayall telescope at Kitt Peak and its counterpart in Chile for which Goldberg had been helpful in raising a substantial contribution from the Ford Foundation. Numerous auxiliary instruments such as image-dissector scanners were designed and built and the first attempts were made to study a "supertelescope" (15-to 25-meter aperture). During much of his administration at KPNO Goldberg was ably assisted by Beverly Lynds whom he married a year before his death in 1987. Goldberg's problems arose not only from having to do more with a smaller budget but also by the increasing complexity of management. He reached the compulsory retirement age of sixty-five in 1978, but in 1977 the AURA board gave him a three-year appointment as distinguished research scientist at KPNO, where he remained as a research scientist until 1983. In 1984, after serving as a visiting professor in France (1980) and in London (1984), he became an associate in research at the HCO. In 1985 Goldberg became the first appointee to the Martin-Marietta chair of space history at the Smithsonian Institution's National Air and Space Museum, a fitting recognition of someone who had so markedly contributed to the success of the U.S. space science program. 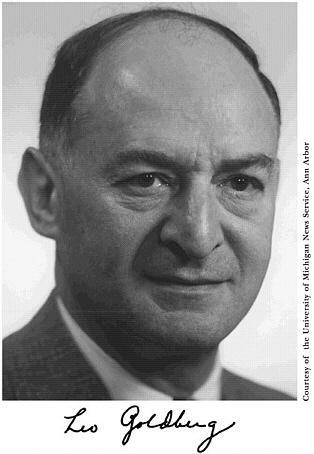 Goldberg's research contributions began as an undergraduate student in 1935, when, under the inspiration of Menzel, he undertook the calculation of relative multiplet strengths in a transition array. How to calculate relative strengths of lines in a multiplet was already known. Soon thereafter he developed the concept of fractional parentage, later adopted by Racah as a basic element of his algebra, making it possible to calculate relative line strengths for all the lines in the most common transition arrays encountered in astrophysics in line-strength coupling. With such data it was possible to interpret the intensities of the spectral lines (e.g., of Ti II) in the solar spectrum and derive the excitation temperature of the solar atmosphere. To obtain the actual abundance of the relevant element, one had to determine (by calculation or by experiment) the absolute strength (or f-value) of the transition. Goldberg explored calculating f-values theoretically using quantum mechanics. He succeeded in calculating good f-values for neutral helium and applied them to the interpretation of gaseous nebulae and hot stars. Computational means did not then exist to tackle many more complex atoms. Determination of elemental abundances in the solar atmosphere by Goldberg, Edith A. Müller, and Lawrence H. Aller constituted the first thorough investigation since the work of Henry Norris Russell, thirty years earlier. The observational data consisted of total intensities or equivalent widths of the Fraunhofer lines of the solar spectrum from published sources or from data obtained with the vacuum spectrograph at the McMath-Hulbert Observatory. Most workers had assumed that the solar atmosphere could be represented as an isothermal stratum at a fixed temperature and pressure. Goldberg et al. took into account the actual variation of temperature and pressure through the radiating layers by the method of weighting functions. The poor quality of then available experimental f-values, especially for the important element iron, seriously affected the quality of the results. Reliable theoretical f-values were few. More recent investigators, using trustworthy f-values but essentially the same methods as applied by Goldberg's team, have found the chemical composition of the solar atmosphere to match that of carbonaceous chondritic meteorites. Incidentally, with the Pb S detectors at the McMath-Hulbert Observatory, Goldberg, McMath, Orren Mohler, and Keith Pierce investigated for the first time carbon monoxide and certain atomic lines in the infrared spectrum of the sun. The high-resolution vacuum spectrograph permitted a study of the small-scale motions in the photosphere, which later observers identified with the five-minute solar oscillations. In 1966 Goldberg showed that slight departures in hydrogen from Boltzmann's law would produce population inversions and give a maser-like action that would act to intensify certain hydrogen recombination lines. Consequently, one must use caution in interpreting the intensities of nebular radio-frequency hydrogen lines. Another important factor emerging for the interpretation of certain lines in the spectra of gaseous nebulae and for understanding observations of the solar corona is dielectronic recombination, which enhances the rate at which ions and electrons recombine. For example, in neutral carbon (C I) Goldberg and Dupree showed that levels of high total quantum number would be overpopulated by dielectronic recombination, producing anomalous intensities for radio-frequency lines. It was in the satellite observations of the outer envelopes of the sun that Goldberg did his most spectacular and important work. Early in 1958, with the collaboration of Haddock, Liller, and Aller, he prepared a report for McDonnell Aircraft Company entitled "Astronomy from Space Vehicles." Shortly thereafter the National Aeronautics and Space Administration was established, and began to make serious plans for space research. In 1960 Leo moved to Harvard, where despite heart-breaking problems with the first orbiting solar observatories, he achieved spectacular success with OSO IV, OSO VI, and Skylab 1973. The object of these experiments was to make monochromatic solar images at any chosen wavelength. This quick look and control capability enabled astronomers at the ground station to monitor and respond immediately to phenomena such as solar flares. One could command the satellite to produce an image in Mg X, N V, or C IV, thereby looking effectively to different levels in the chromosphere, the corona, or transition regions. Thus, one obtained the plasma diagnostics of these regions. Certain strategic lines (e.g., Mg X) occasionally appeared very weak in some areas, which Goldberg identified as ''holes" in the corona! They were of special interest to X-ray investigations, being areas from which originates a good part of the solar wind. The shock tube laboratory, operated by Parkinson and Reeves, produced small volumes of gas momentarily at high temperatures and densities appropriate to astrophysical plasmas. This device makes it possible to measure f-values and identify molecular and atomic lines that can be compared with solar and stellar spectra. The vibration-rotation bands of CO had been found in the infrared as noted above; the electronic bands of CO were identified in the ultraviolet. The satellite solar work and its supporting laboratory measurements have proved to be of crucial importance to our understanding of the sun. Goldberg was also interested in seeing that scientific information was made readily available; hence, he played a leading role in the establishment of Annual Review of Astronomy and Astrophysics. An earlier phase of this interest was shown in a volume in Harvard's Books on Astronomy entitled "Atoms, Stars and Nebulae" written in collaboration with Aller. The decisive role that Goldberg played in the International Astronomical Union (IAU) may not be well known. Soon after receiving his Ph.D. he attended the IAU meeting in 1938. He was chairman of the U.S. delegation to the tenth general assembly in 1958 and eleventh assembly in 1961. He was a vice-president (1958–64) and president (1973–76). The cold-war rivalries in the United States and the Soviet Union flourished in the 1950s. The Soviet Union invited the IAU to convene in Moscow in 1958 and proclaimed that astronomers from all member countries would be welcome. To save face, the United States would have to host the meetings in 1961 under the same guarantees that the Soviet Union had given. Astronomers from all member countries would be welcome. In particular, since the People's Republic of China (PRC) was an IAU member, its astronomers would be allowed to attend, but Taiwan was not a member at that time. PRC athletes were to attend the 1960 winter Olympic games in the United States. The Department of State headed by Secretary Dulles observed that this action was ad hoc and did not imply that mere scientists could expect such favors. Goldberg contacted his representative in the U.S. Congress, George Meader, a conservative and fair-minded Republican, who presented the case to Dulles, who referred it to his science advisor Wallace Brode. Brode promptly demanded that Taiwan be invited to the IAU. The fact that Taiwan then had no astronomers and would have to qualify for IAU membership in the approved way meant nothing to the militant anti-Communist Brode. Brode wanted Goldberg to go to the 1958 Moscow meeting and submit the 1961 invitation but with the condition that Taiwan be admitted at once. Such a demand could well wreck the IAU. From Brode's point of view, if the astronomers would not go along with his orders, so much the worse for them. Goldberg was unable to submit to these demands and offered to resign, but the National Academy of Sciences supported Goldberg's position that the IAU should act onthe application of Taiwan in an orderly way. The invitation for the IAU to meet in the United States was issued and accepted. Taiwan was admitted to membership in 1959; the PRC withdrew in 1960, but returned later. Today astronomy is flourishing in Taiwan. Goldberg's quiet diplomacy saved the IAU from disintegration and the world astronomical community from a severe blow. Leo Goldberg was married to Charlotte Wyman in July 1943. They had a daughter, Suzanne, born in 1944, and two boys, David and Edward, born in 1946 and 1951, respectively. Leo and Charlotte were divorced, and Leo married Beverly T. Lynds in January 1987. Goldberg received many honors and was a member of a number of learned societies. In addition to the National Academy of Sciences (1958), he was a member of the American Academy of Arts and Sciences (council, 1979–82) and the American Philosophical Society (1958). He belonged to the American Geophysical Union, American Astronomical Society, American Physical Society, Astronomical Society of the Pacific, Optical Society of America, and the Royal Astronomical Society, and was a foreign member of the Royal Society of Liege. Goldberg served on more than a hundred committees covering a wide range of interests from cultural affairs to science. In 1973 Goldberg received the Distinguished Service Medal from the National Aeronautics and Space Administration and gave the Russell Lecture of the American Astronomical Society. He gave the George Darwin Lecture of the Royal Astronomical Society in London in 1984, and received the George Ellery Hale Prize of the American Astronomical Society in 1984. He received an honorary degree from the University of Massachusetts (1970), University of Michigan (1974), and University of Arizona (1977). Leo Goldberg was a great human being, generous and helpful, as well as a great scientist and superb organizer. When he believed he was right, he could be very obstinate, but always in a logical sort of way. He looked at a problem from a very different point of view or he adopted different priorities. My first contact with Leo Goldberg was while I was a student in Berkeley (1934) wanting to go to Harvard to work with Menzel. I was very discouraged about financial prospects, but Leo gave me a realistic appraisal in such a friendly letter that I was encouraged to take the chance. My last contact with Goldberg was at a National Research Council meeting in February 1987. He seemed cheerful and optimistic, looking forward to his new assignment with the National Aeronautics and Space Administration. He announced he had had lung cancer, caused by years of heavy cigarette smoking, but that he had licked the affliction. My immediate reaction was one of worry and deep apprehension. Tragically my concerns were justified. Leo Goldberg was my friend who helped me attain goals of scientific achievement that otherwise would have been beyond my reach. I AM GRATEFUL FOR valuable information and advice supplied by a number of Goldberg's associates, particularly Frank Edmondson, Jesse Greenstein, and Donald Osterbrock.